The Small Isles comprise Rum, Eigg, Muck, Canna and Sanday and are accessed via Arisaig on the MV Shearwater (summer only) or from Mallaig by Caledonian MacBrayne (year round). These ferries are passenger ferries only. Visitors are not generally permitted to take vehicles to the islands. 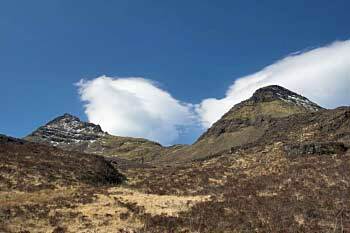 The small archipelago is situated south of Skye and north of Mull and Ardnamurchan. The Gaelic name for these islands – na h-Eileanan Tarsainn – translates literally as ‘cross isles’ referring to their position between Morar and The Uists. West Word is the community paper for Mallaig, Morar, Arisaig, Lochailort, Glenfinnan, Glenuig, Knoydart and the Small Isles and is available online. The largest of the islands is Rum, often misspelt Rhum. It is said the ‘h’ was inserted by an erstwhile landowner who did not want the island to be associated with the alcoholic beverage! The name is either Old Norse, meaning ‘wide island’ or Gaelic meaning ‘isle of the ridge’. The island measures 40.4 square miles and is largely volcanic. In 1825 there were about 425 people living on the island, but the ruthless clearances saw the island cleared of its population. In 1845 it became a sporting estate, then between 1850 and 1888 it passed hands several times. In 1888 it was bought by John Bullough as a private holiday retreat and the island entered a golden age of opulence. The stud of the native Rum pony was re-introduced by John Bullough in 1888. After his father’s death, George Bullough commissioned the construction of the grand Kinloch Castle. Building commenced in 1897, providing employment for over 300 stonemasons, carpenters, woodcarvers, stained glass makers and many other specialist tradesmen. One in particular however was almost unique, that of electrician, as Kinloch Castle was the only place outside Glasgow that had electricity at the time. A dam was constructed on the Coire Dhu burn for hydro generation. The bill for this exceptional piece of grand architecture and bespoke decoration was approximately £15 million in today’s money. The Castle was finally completed in 1902. Its original function was a hunting lodge. The First World War and the Great Depression of the 1920s struck the Bulloughs hard, however, and things were never the same again; exclusive deer stalking trips to Rum for the elite soon came to an end. George died in 1939 and both he and his father are buried in an ornate mausoleum at Harris on the west of the island. The Nature Conservancy Council (now Scottish Natural Heritage) bought the island in 1957 and it has been managed by them since then. There are no indigenous residents left on the island today. Its modest population of 22 is made up entirely of SNH employees and their families, a schoolteacher and a few researchers. All live at Kinloch on the east side of the island. The once exclusive Castle is now a museum piece and a hostel with its own bistro and bar. Though there are few human inhabitants left on this wild island, Rum is home to one of the largest Manx Shearwater colonies in the world, as well as nearly 1000 Red Deer and both Golden and White-tailed Eagles breed here. There are also plenty of otters and an otter hide has been erected a short walk away from the ferry. The Rum Pony is also worth a mention. It is the oldest Highland Pony stud in the world and one that was once much more widely distributed in Scotland. However, in many parts of Scotland this pony has lost its distinctive features due to hybridisation. Rum’s isolated geographical position meant that this species survived much longer in its original form, or at least a lot closer to it, which means that the Rum pony is a veritable Scottish animal. Whilst now domesticated it retains many of its original wild characteristics. 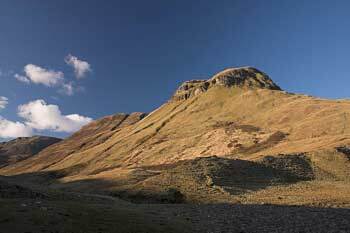 The Isle of Rum is not for the faint-hearted. There is a lot to explore here, but the terrain is tough and there are few paths. Although Rum’s Cuillin ridge is not as high as that of Skye, it is still a very challenging 13 miles of ascent and descent, taking in up to six peaks and, on a good day, some fantastic views. There are other walks to all the compass points on the island, but all are long and difficult, so be prepared. There is also a much shorter nature trail walk, suitable for day-trippers. Other possible activities include cycling, kayaking, fishing and deer stalking. There is also a craft shop and tea room at Kinloch. 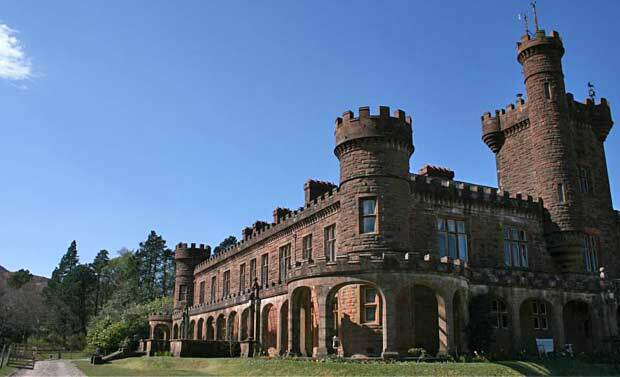 Kinloch Castle tours operate daily in the summer and by request in the winter. The text and photo’s are courtesy of Becky Williamson who lived on several islands in The Small Isles. Lonely Planet Scotland is your passport to the most relevant, up-to-date advice on what to see and do. A handy and helpful guide for all.